Banks Try To Save Big With 'ATMs Of The Future' : All Tech Considered An ATM that lets you video chat with a teller hundreds of miles away? It's part of an effort by the banking industry to cut costs: The more ATMs can do, the less banks have to spend on tellers and real estate. But in-person branches still remain the best way for banks to get new business. An ATM at a Chase lobby in New York is part of what company executives are touting as a "branch of the future" — a place where machines distribute exact change and count cash so tellers don't have to. 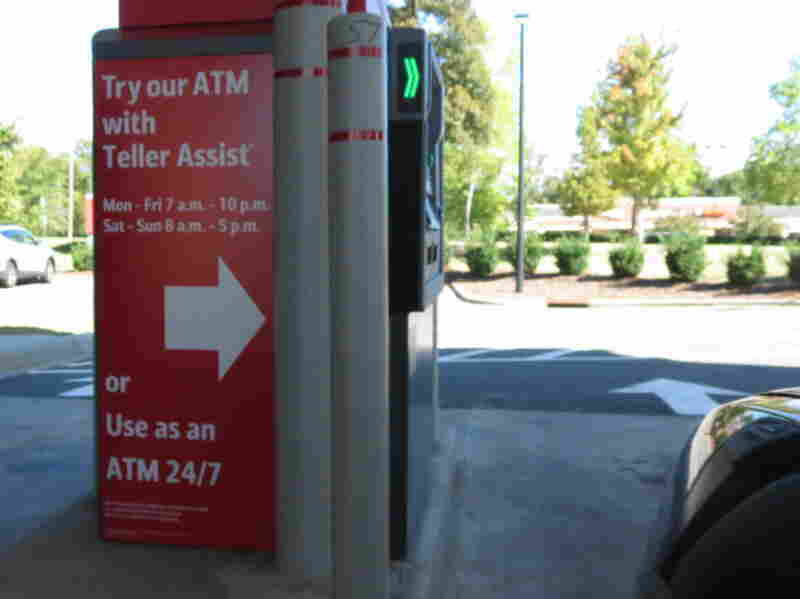 There's a drive-thru ATM in Charlotte, N.C., that looks pretty standard, but it has an extra function: a button that says "speak with teller." The face of a woman wearing a headset sitting in front of a plain blue background flashes onto the ATM screen. "Good afternoon," she says. "Welcome to Bank of America. My name is Carolina. How are you today?" She's one of a cadre of Bank of America employees in Florida and Delaware call centers, where they remotely control ATMs across the country. I ask for $26. "Just a $1, a $5 and $20," I say. The details of my transaction pop up on the screen. I press "confirm," the machine spits out my bills, I thank Carolina and I drive off. Bank of America started rolling out these virtual tellers in Charlotte, New York, Boston and a few other cities earlier this year, with plans to expand further. Meanwhile, PNC and Chase have been introducing "ATMs of the future," as some in the banking industry have called them, which dispense singles and $5 bills. 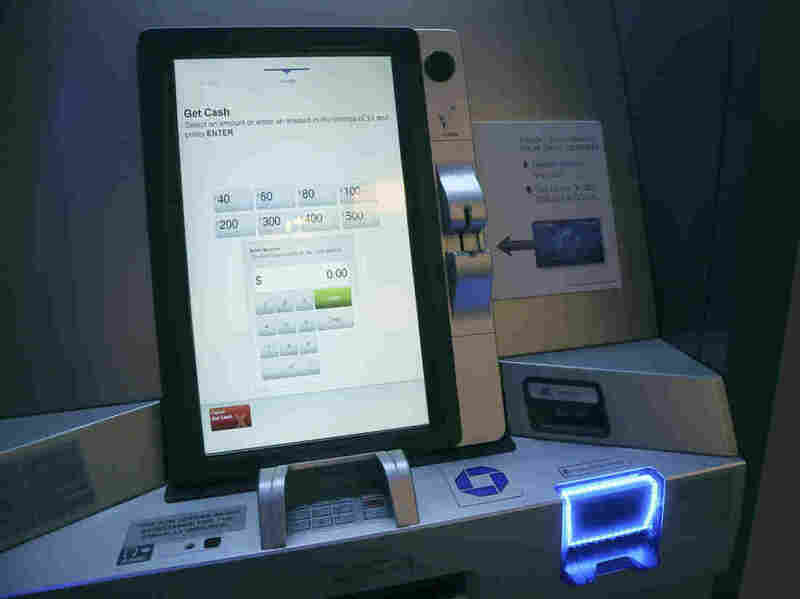 Citibank has ATMs that let customers open accounts and pay bills. Analyst Nancy Bush says banks ultimately see the ATMs as money-savers. "There is a very large need for banks to continue to control their costs, and of course branches, branch personnel, etc., are one of the banks' largest costs," she says. So the more services the ATMs can do, the less banks have to spend on tellers and branches, which are expensive. But branches are seeing less traffic than they have in decades, as mobile and online banking have taken off. The firm SNL Financial reports that about 3 percent of U.S. bank branches have closed in the past four years. Instead of spending on real estate and staffing, banks can install street-corner ATMs and pay fewer employees to video chat — or eliminate branch workers altogether. But that leaves one problem, Bush says. "They want you to be able to access services through technology, but they still see the branch as their biggest revenue generator," she says. Banks want to get you into the branch so they can sell you more products. Bank of America calls it the stair step. CEO Brian Moynihan explained it to investors this month at a conference: "We're working them from checking account to core checking account, to a credit card, then to auto loan and ultimately to a mortgage loan, and then to investment. And this happens literally thousands of times a day." So banks are launching the hybrid branch, like one Chase branch next to Grand Central Station in Manhattan. There's a lot of open space and no tellers. Instead, customers use Chase's "ATMs of the future" in kiosks along the walls. In the center of the room there's an equivalent to Apple's Genius Bar — a place where customers can quickly meet with bank employees for the things the ATMs can't do, branch manager Jennifer Deluca says. "New debit card, change of address, change of PIN, anything we can do kind of quick transactions," she says. "It's midtown Manhattan. Instead of taking you over to a desk and kind of going through all of it, we can get you in and out as fast as you'd like." But upstairs, there's still a traditional bank with loan officers and financial advisers at desks. And while this branch is huge, removing tellers means Chase can move into spaces as small as a coffee shop. Bank of America and Wells Fargo opened their own similar hybrid branches earlier this year in New York and Washington, D.C. Some employees see the new ATMs and branches as a threat — another wave of machines replacing humans. Bank of America tellers recently picketed the new machines in Manhattan. Banking executives respond that the traditional branch isn't going away completely; the new technology is just a complement. And that's because, they say, many people still prefer to bank with a real person instead of a video screen.